The paintings and drawings of the Netherlandish artist Jheronimus Bosch (ca. 1450-1516 CE) rank among the most creative works of art that mankind has produced. Bosch, working around 1500 in the city of ’s-Hertogenbosch, the northernmost more or less major city in the duchy of Brabant, challenges the minds of those who wish to gain some understanding of his creations. Others he just leaves in awe with his weird pictorial inventions. The most classical minds among us might feel uncomfortable when seeing the counter natural hellish scenes. When the work of Bosch is being discussed dispute is never far away. Bosch is fast, capricious, angry, scared, humorous. His work is old and rare; important heritage that was made in an age of transition, that confusing period around 1500, the age of discovery, church reform, world empires, urbanisation, capitalism. The work of Bosch is relevant especially in times of uncertainty, anxiety and moral dilemmas. The Haywain, a painting that might better be called The Triumph of Greed, has an iconography that was single-handedly invented by Bosch. It is a brilliant visual emulation of Petrarch’s Trionfi (1351-1374). If Petrarch can be regarded as the inventor of humanism, Bosch can be viewed as his pupil. Bosch’s Wayfarer on the outside of the wings of the Triumph of Greed is another landmark in this respect. Instead of a saint, a grisaille imitating sculpture or something like that, Bosch depicts a vagabond, a nobody who is everyman at the same time. He is the pilgrim of life, bending to get through his earthly existence. This too is an innovative iconography in which no hero but an ordinary and inconsiderable man is been given center stage. Isn’t that a work for the 21st century? The pilgrimage of life in times of mass migration and The triumph of greed in the age of hypercapitalism. Of course the analogies between a painting over 500 years old and modern times cannot but fail. Times have changed immensely and it takes hard and diligent work to understand only a little bit of those ancient times. And yet, when studied patiently our reward is that we feel a sense of connection with the people and their culture. That is the work of art historians and conservators: preserving our historical roots and making those roots visible and understandable, in both their familiarity and alterity. Through our publications and exhibitions we pull the past into the present. In addition to these classical means, online tools have begun to play an increasingly important role in this respect. In the Bosch Research and Conservation Project, started in 2010, we try to combine and integrate these elements. 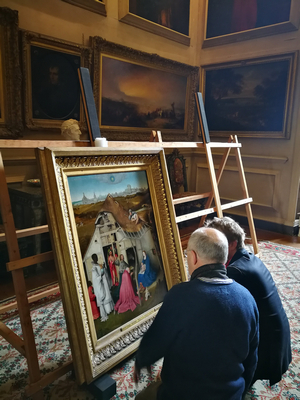 In the first term of the project the aim was to document and analyse all the paintings that are more or less unanimously attributed to Bosch according to a standardised protocol. The idea behind this was that we want to try compare artworks as much as possible and not photographs. This is easier said than done and it requires the work of a professional photographer and a conservator with an interest in research. From a scientific point of view a standardised research set up is only natural but from a practical point of view this means trying to create similar circumstances in cultural environments that are not necessarily similar at all. The reason why we went to great lengths to document Bosch’s paintings and drawings so extensively is that we realised that these artworks are really our primary sources and those documents could be disclosed at a much higher level than had been done so far. Instead of a ‘high resolution’ image of 5000 pixels we can also make an image of 50.000 pixels with relative ease. And we can do that not only for images in visible light but also in infrared and X-ray. However, in order to make these accessible, some arrangements have to be made. One needs an online tool with viewers to make this work. This, for now, became http://www.boschproject.org. It is currently the most extensive online data set for a single painter available for everyone with an internet connection. Another aim of the BRCP is to help to keep the legacy of Jheronimus Bosch in good health. This means that the project funded several extensive restoration projects and provided advice during several other conservation treatments. The conservator on the team, Luuk Hoogstede from SRAL Maastricht, was a trainee in the Getty’s Panel Paintings Initiative, a project in which paintings conservators with a special interest for wood were trained specifically in the structural treatments of panels. 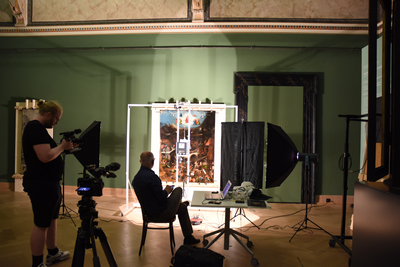 The Panel Paintings Initiative awarded the BRCP a substantial grant for the structural treatment of the paintings by Bosch in Venice and Bruges as well. In the period 2010-2016 no less than twelve paintings from a group of about twenty five were treated. Six out of those twelve restorations were made possible by the BRCP. All treatments were carried out at the initiative of and under the supervision of the institutions (i.e. museums) responsible for the paintings. A particular extensive collaboration existed with the Gallerie dell’Accademia in Venice, where structural work on the panels was carried out by Roberto Saccuman and his trainees from the Panel Paintings Initiative, whereas Giulio Bono and his colleagues were responsible for the treatment of the painting surface. Under the supervision of chief restorer Chiara Maida this project was carried out between 2013 and 2016. In February 2016 a large retrospective of Bosch’s work opened in his hometown ’s-Hertogenbosch, The Netherlands. In that exhibition special attention was paid to what one might call the objecthood of artworks. Triptychs were presented in such a way that the audience could walk around them and appreciate their three dimensionality. Both recto and verso of drawings were shown, creating the same effect. On six occasions during the itinerary monitors showed small films (image only) in which various aspects of the physicality of paintings and drawings were presented, be it the reconstruction of a triptych, the discovery of hidden figures underneath the current paint layer or the close comparison between original and copy. All these little films were only possible because of the extensive documentation made by the Bosch Research and Conservation Project. This way we connected research, conservation treatment and the presentation for a large audience. With the Bosch Research and Conservation Project we continuously try to bridge the world of accademia, museums and conservations studios. In our research, our writings and the exhibitions that we curate, we will always look for ways to present the objecthood of art works. From that objecthood, one can develop thoughts in all sorts of directions, be it iconological, sociological, economical or anthropological. The first term of the BRCP ended in 2016 with the publication of a two volume monograph on Bosch, exhibitions in ’s-Hertogenbosch and Madrid and the publication of boschproject.org, where a large portion of the visual documentation of the project is shared online. However, several important questions still remained unanswered, and to a number of paintings the project had not been granted access, among them the large and extremely important Last Judgment Triptych in Vienna. Only in the summer of 2017 was the BRCP team invited by the newly appointed director of the Gemäldegalerie of the Academy of Fine Arts to carry out its investigations. This was the start of the second term of the BRCP, in which we will be focussing more on questions with regard to the workshop that Bosch was running instead of highlighting the singular genius that he undoubtedly also was. Bosch was also a business man and a member of a family of painters. Therefore we may rightfully ask the question whether it is justified to focus only on what we now consider to be the best paintings and drawings. Probably a richer historical picture can be painted and that’s what we will be trying to do in the years to come. A first essay in this direction will be an exhibition in the Noordbrabants Museum in ’s-Hertogenbosch in the Netherlands, devoted to The Adoration of the Magi, a theme that Bosch painted at least two times and led to his most copied painting, namely the Prado Epiphany. This show will open in December 2018, and, like in 2016, it will be accompanied by both a written catalogue and a website with new material.